Hubs has been very busy these days, working on creating a MO costume for our little bub. That's MO from the movie WALL·E. Spud's latest passion. Not the cranky, tavern owner Moe from the Simpsons, as one of my co-workers suggested. It's really coming together. My favourite parts so far are the retractable arms and the bowed shape of the body. Some fine work there. Until 2:30 this morning! 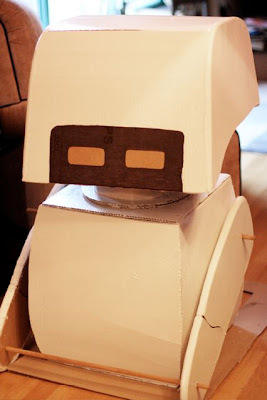 The arms are made up of layers of hot-glue-gunned cardboard, routered and then polyfilla'd / sanded edges to give a rounded appearance. There are a few details that will be added today, like, MO's brush and his eyes. I will keep you posted.